Being mentored enables you to learn from another person’s vision, experience, and learning, and get professional guidance on the challenges you encounter. A recent mentee says: "I would highly recommend this mentoring program to anyone doing management in development. It's a great support system for sharing best practices, lessons learned and most importantly, perspectives". A current mentee says: "I had my first skype call this morning and it was surprising how much our paths have crossed and how my mentor's career is similar to what I would like mine to be in the future. So I think it will be an excellent match". To become a mentee take a look at the video "How to Find a Mentor" and follow the simple steps below. There's lots of useful information on our Resources page to help you. Also there's a flowchart here to give you an overview of the mentee process. The service is provided at no cost to users. 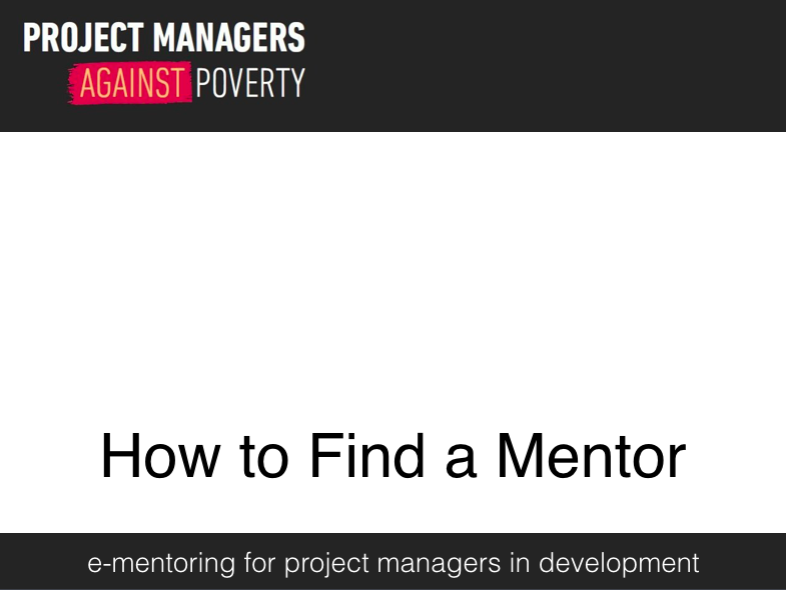 To qualify for mentoring you should be working in international development or the third sector, and be involved in managing projects or seeking to become a project manager. Ideally you will have passed or be studying for the PMD Pro Level 1 or other methodology, but this is not essential. The PMD Pro (Project Management in Development for Professionals) was established to build on established methodologies and so provide common standards and practical guidance to run development projects. It recognises that while good project management principles are universal, development projects have unique challenges. Watch the short video. PMD Pro is managed by pm4ngos and an excellent on-line starter guide to PMD Pro can be found at pmdprostarter.org, also at pmdpro flex and at pmdproforward.org. Also a quick guide to the PMD Pro can be downloaded for free here. This Code of Conduct was last updated on 23 March 2018. An extra line was inserted at the end of the "As a mentee" section. Skills & Expertise: Enter the skills & expertise that you want to be mentored in. An accurate list will help to match you to a suitable mentor. Click the question mark icon to see the drop-down skills list. Select the relevant skills one at a time and click Add each time. You can add your own Skills but it's better to keep to the list as this will improve your chances of a good match. Once you are happy with your profile click Submit (you can always login and change it later). You will receive an email confirming your registration, awaiting activation by the administrator. Make sure that this message is not spammed out! You will receive another email once your account has been approved and activated. When you click this you will see a list of available mentors who possess some or all of the skills and expertise that you seek. Note that you will only see a list of mentors at this stage if you have completed your skills/expertise and there is a match between your skills/expertise and of the mentors. If there is no match at this stage, or if you want to expand the search, you can enter keyword search terms and do a new search. Click on the name to see the full profile of each mentor with their skills. Note that it's sometimes better here to right-click and “open in new tab”. That means you can easily get back to the search results again. When you have chosen a prospective mentor, click Request Match. By the way, you can also send a message to the mentor to discuss your needs before clicking Request Match by clicking the message icon above. Once you have clicked Request Match a box appears to which you can add a message explaining the reasons for the match request. Leave the score box blank. Now click Send to send the request. A message appears confirming that the request has been sent. Now wait for a response. You will receive an email either accepting or rejecting your request. Please be patient! Please do not send multiple requests!. Just one at a time! Write down a few bullet points about the help you need. Log in and search for a mentor using the Request a Mentor search facility or just browse through the list of mentors. Look closely at the profiles of the mentors that roughly match what you are looking for. Then, for those with a reasonable match, send a message to each person with your bullet points to enquire whether they think that they can help you. Use the Messages facility on the website. Look at their replies and then (hopefully) chose a mentor. You can either click the Request a Mentor button in your Profile and click Request Match on the mentor profile you want from the names displayed or send a secure message to the Administrator (Peter Marlow) who can connect you. When you get a response, your new mentor will send you a secure message. To see this, and to reply, login to the website and click the Messages icon on the top right of your profile screen. Arrange a date and time for an Initial Meeting (see below) with your Mentor and agree how you will communicate: on Skype or FaceTime, or using the secure conversation (message) facility on the website. It is important that you make a record of your meetings with your Mentor in your Activity Log on the website. On the agreed date and at the agreed time and date you, as the Mentee, should initiate the Skype/FaceTime session or start a conversation through the website with your Mentor as agreed. Your goals & objectives as the focus of our mentoring relationship (add 3 or 4 objectives). How you will communicate. It's best to use the secure Conversations messaging facility on the website. Or you could meet on Skype/FaceTime. You can also upload documents to share. Record the details of this Agreement in your Activity Log or create a joint document and upload it to your document area where it can be shared. When you have finished you should close the relationship and record this on the Activity Log. Review how things went and also record this in the Activity Log. Your Mentor will then formally close the relationship. A flowchart showing the e-mentoring process for mentees is here.